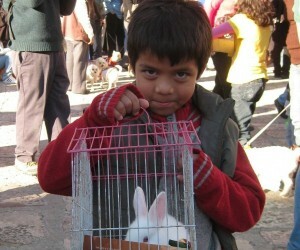 In honor of St. Anthony the Abbot, special animal blessings are held throughout San Miguel on January 17th. 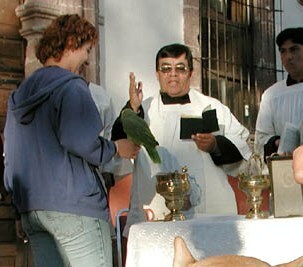 Blessing are for the pets and farm animals of every shape and kind, from cats, dogs, birds and turtles, to hens, rabbits, ducks, and burros are brought to the churches to be blessed by the priest. This moving ceremony is believed to keep evil spirits away from the home and land. The concept is tied to the pre-Catholic customs of celebrating animal fertility and regeneration of the fields between the winter solstice and summer equinox. St. Anthony the Abbot was a hermit and early monk who lived in seclusion in Egypt’s desert. Animals were his only companions. The indigenous here believed strongly in the equilibrium between man and the natural world and readily accepted St. Anthony the Abbot’s protection of otherwise defenseless domesticated animals. St. Anthony changed ancient man’s the perception of the pig as a dirty animal with ties to the devil, to edible livestock. Consequently in art, St. Anthony the Abbot is commonly seen between a dog and a pig. This St. Anthony is not to be confused with the much later St. Anthony of Padua for whom the colonia San Antonio is named and Dia de Locos is celebrated in honor of. Locations vary but the blessings are most commonly held at the Parroquia, the Oratorio, San Antonio and San Juan de Dios.